When the Tiger Woods vs. Phil Mickelson match-play showdown was first reported in July, Woods was still winless since 2013 and working his way through his latest comeback. Now, after his victory at the Tour Championship on Sunday, Mickelson might have his work cut out for him. After all, Mickelson finished last in the 30-man field at East Lake, 24 strokes behind Woods. During his Ryder Cup press conference on Tuesday in France, Mickelson joked that he might need a little help after Woods’s latest performance. “I’m trying to negotiate a shot a side,” Mickelson said. “It didn’t go over very well in our initial discussion, but I’m still working on it. We got some negotiations to do given how well he played last week.” Mickelson's last victory came at the WGC-Mexico Championship in March. He has 43 career PGA Tour victories compared to Woods's 80. "This is the best I think I've ever seen him swing the club, even going back to 2000, when I thought he was at his best," Mickelson said. "He's striking it so solidly that nobody was surprised that has played with him that he won, and I think that now that that first win is out of the way, I think he's going to start rattling off some more." Mickelson reiterated his press conference claims later Tuesday on Twitter. https://twitter.com/PhilMickelson/status/1044618306575974401 Mickelson and Woods confirmed the match play event for $9 million in August. It's set for Thanksgiving weekend in Las Vegas, reportedly at Shadow Creek Golf Club. 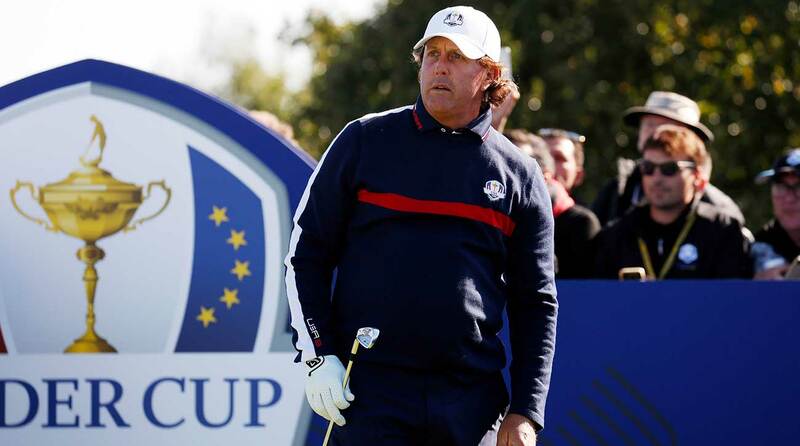 This week will be Mickelson's 12th Ryder Cup appearance.